Well, stampers, here we are at another Blogger's Challenge Friday. Our challenge mom, Lisa, had us work with the color combination of Riding Hood Red, Old Olive, Really Rust and a neutral if needed. Here's how I usually approach a color challenge - I pull out one sheet each of the colors, plus a couple of different neutrals. Then I pull out the matching ink pads and lay it all out on the table in front of me. I shuffle the cardstock, trying different colors on top, middle and bottom until I see what I like best. Next, I peruse (that's a 50 cent word for you today) my stamp sets and choose one that will display the colors to their best advantage - or I just pick the one I like best, whichever comes first! Anyway, today, I chose to work with Fabulous Flowers, one of my all time favs - "Dare to be Fabulous" is the sentiment in that set - love it! 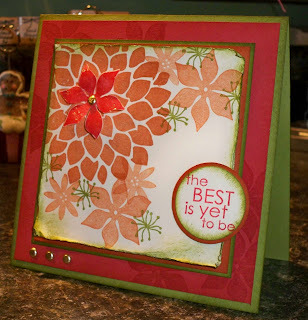 My top layer is Naturals Ivory cardstock and I stamped it with that gorgeous Mum like flower first in Really Rust ink. Then I chose the two smaller flowers and stamped them also in Really Rust, but stamping off first on my Grid Paper to dilute the color. The little weed flower is stamped in Old Olive ink. This layer was just screaming to be distressed, so I complied and really beat it up with my Bone Folder. It still needed something, so I added Old Olive ink to all the edges with my Stampin' Sponge. Well, as you can see, once I had the sponge in my hand, I just couldn't stop at one layer, so A La Patti Chesky (may she live forever) I sponged EVERYTHING! You are so in my head this week Patti - can you now convince me to stop eating junk food? Oh, you want to know how I finished this card, ok, let's get back to it. I stamped some more flowers on the Riding Hood Red cardstock layer in Riding Hood Red ink, but just in two of the corners - didn't want to overdo it! Then came the three Gold Brads in the bottom left corner which I added with my Mat Pack and Paper Piercer so I could line them up correctly. Then, I stamped one more flower in Riding Hood Red on Naturals Ivory Cardstock and trimmed it out with my Paper Snips. I curled the petals with the side of my Bone Folder and added a Gold Brad to the center. To really make it pop, I took a page from Selene Kempton's book and painted the flower with Crystal Effects. Yeah, really! It was attached to the center of the Big flower with a dimensional. The greeting is from Best Yet (Level 1 hostess set) stamped in Riding Hood Red, sponged in Old Olive, punched out with the 1 1/4" Circle Punch and layered on a Really Rust 1 3/8" Circle. Yes, you guessed it, I popped it up on dimensionals. Now, I intended to place the greeting higher on the card, but truth be told, I got it too close to the cardstock while I was talking to my daughter and it stuck where it is. Thank goodness it's straight! And actually, I kind of like it there. I really hope you like this card and I really hope you like reading my blog. Some of you have told me how much you laugh as you read my posts - thanks for that! I just hope you are laughing at my crazy life and not my cards - because then I would cry, and that would get my all cardstock wet, and then I couldn't stamp anything, and then you would be sad too. So you see, you need to like my card so I can keep stamping for you! I don't want you to be sad! Love you guys! Be sure to check out the other Blogger's Challenge players artwork too - just click on the link in my sidebar. What an awesome card, Robin. I just adore your post...all the colored text to match the color...how very clever and eye catching. Your card looks absolutely wonderful with this color combination. Awesome card, I need to pull out that set more often. Love how you placed the colors together and the EXTRA sponging you did! Heck, I couldn't get you to stop eating junk food....I would make you sponge your junk food!!! LOL!!! I love this card!! I own this stamp set and can never get it to look right. I'm going to CASE your card!! It's beautiful!! This is sooo lovely! I have not purchased this set, but the more I see it, the more I wish I had it! TFS! This is gorgeous!! I never got this set, I really love this card. Very nice. I think your sponging is perfect! and The card is just Fabulous! I'm a Crystal Effects addict, and my customers are catching the bug I think. I love what you did with the colors. After reading your post this morning, I decided to take the paper out and lay it out on the table too.. I love what i came up with ~ but ummm had the wrong colors. Adult ADD... Great job! Beautiful Robin - great choice of stamps for this weeks color combo challenge! i love what you did here!!! the layout of the flowers is beautiful! Your family has great taste because this is a lovely card. Wonderful image and it looks so festive. I think it is great!! I had fun reading this post - great card and layout. This card is just awsome! The flowers look just fabulous in this color combo....who knew?!! Autumn came to mind when I first saw the colors and many of us made our cards with that idea in mind....it's so refreshing to see an entirely different idea.....although I adore Fall-themed cards! Love the post...AND the card!! Wow, this is so pretty. Great choice of stamp sets for this challenge. Beautiful card! Perfect flower for the color challenge. Fabulous Fall - My Favorite Season! Monkey See - Monkey Do! Big Shot Box - So Fun! Yet Another Reason to LOVE Stampin' Up!